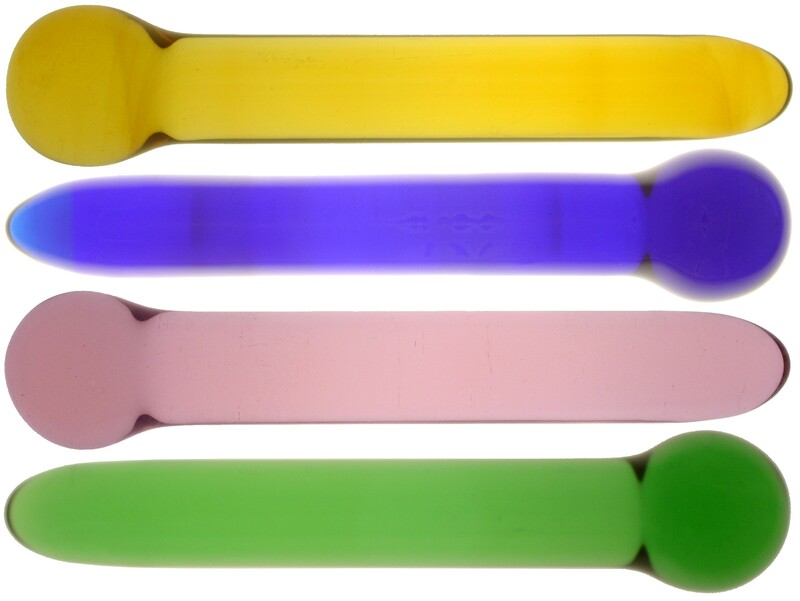 This color pyrex glass toy features a smooth shaft and a ball base. The ball base allows for easy gripping when using the toy. It averages about 7" long and the shaft averages about 1" in diameter. What are the advantages of pyrex toys? - Top Quality - All of our toys are made from top quality, medical grade pyrex and are 100% safe. - Hypoallergenic - Unlike acrylic, rubber, and vinyl, pyrex will not cause allergic reactions. - Dishwasher Safe - Whenever you're done with your toy, just pop it in the top rack of your dishwasher to completely sanitize it. - Non-Porous - Unlike other materials used to make toys, pyrex will not absorb natural or synthetic lubricants so they glide smoother and your lubrication lasts much longer. - Retains Heat/Cold - One of the most unique features of pyrex toys is that they can be heated or cooled to provide many different sensations. - Colors wont Fade - The colors of toys make from other materials usually fade over time. The colors in our toys are actually part of the pyrex and will never fade. - Good for a Lifetime - The materials used to make other toys will eventually break down. It could be months, it could be years, but it will happen. Pyrex on the other hand will easily last a lifetime and could realistically last several lifetimes. - Polariscope Tested - To ensure the best possible quality, we polariscope test all of our pyrex toys prior to shipping to ensure that they don't have any stress points. Please note that if you do not select a color preference, your item(s) will come assorted. You can also choose "Surprise Me" if you would prefer an assorted color.